For a watching world that frequently doesn’t want to engage or think about such things, it might sound ironic or even inappropriate. They might think such moments have to be about sadness and mourning, but for such people there is a peace and a joy amidst the mourning that only serves to convince me more fully that a Greater Reality lies beyond what we see and know. I know one day things will be put right. It doesn’t mean however that I wouldn’t have some sharp questions for God about many of the things we know and experience in our own lives today. I was struck recently in reading from a new book, Totally Forgiving God, that there are many times in life in which we may experience or observe suffering, tragedies and enigmas that make no sense to us. And yet, if we feel angry with the Almighty, there is no sensible choice but to let Him off. Why? Well, as RT Kendall says in his book, we have to do so because of what it will do for us. Anytime we find ourselves consumed with anger or frustration, the only things that come from such emotion are hurtful. We lash out at others and we fume with bitterness inside. To release it we must forgive. In much the same way as we experience peace when we totally forgive other people, so too when we come to the place where we totally forgive God. Second, Kendall suggests we should forgive because of what it will do for God. It will bring joy to his heart to see us released from unforgiveness. One way to look at God living amongst us in Jesus is because God was concerned to set people free from all that ties us in knots. While he came to enable such grace, he never promised we would be lifted out of the muck and bullets of life. To blame him for such muck, rather than see his hand lifting us out is a perverse way to live. He’ll be delighted to see you living free of such bitterness. 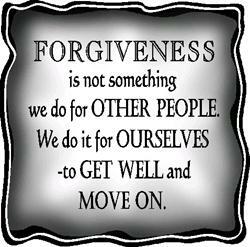 Third, we forgive because of how we will feel on that final day. St Paul said that we live life as if we are looking through a dirty window. We don’t see the full picture now. We don’t understand why some things happen. But St Paul continued, one day we will see… face to face. If we live feeling like God owes us an explanation, lives become filled with self- righteousness and a feeling of entitlement. God will one day set things right. Of that I am sure. One day, all will be clear. In the meantime, we make a choice: to live angry, with self-pity and confusion or to vindicate God, forgive and live by faith. This article first appeared in the parish magazine for West Malling & Offham, October 2012.